Nowadays, there are various players for playback. Two of the most popular players are VLC Player and QuickTime Player. Let’s see the features and differences between the two players. IPhone SE, "The most powerful 4-inch phone ever created", according to the glowing words of Tim Cook, was unveiled on Monday, March 21. Under the big spotlight of Apple's latest product launch event, there comes up a small iPhone unsurprisingly. Compared to iPhone 6 and 6plus series, iPhone SE is more pocket -friendly, retaining the body design of the 5S. Also, it uses nearly the same hardware inside as the current year’s iPhone 6s.Thus, its speed will be guaranteed. This isn’t just a phone for people looking to save money. Speaking of money, the starting price of iPhone SE is $399 — where no iPhone has gone before. 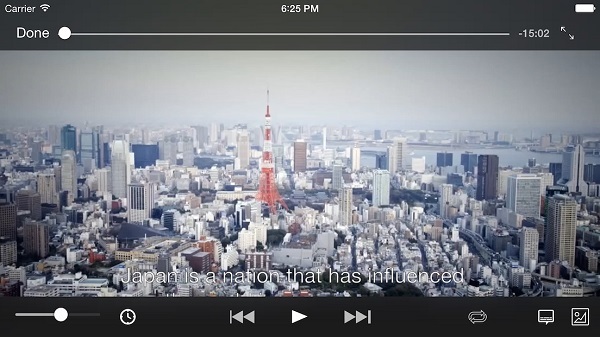 QuickTime Player is an extensible multimedia framework developed by Apple Inc. It is now available free of charge for both OS X and Windows operating systems. The main function is similar to VLC Media Player including handling various formats of digital video, picture, sound, panoramic images, and interactivity. The following are the main features. Saves the embedded video in its original format or in a *.mov file format no matter what the original container is/was. 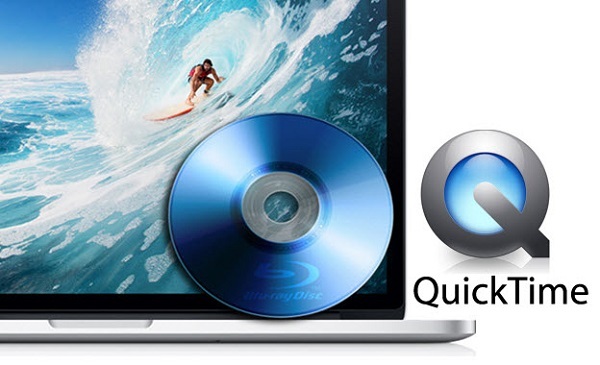 For Mac users, QuickTime Player is the first choice since it is bundled with Mac OS X. For windows users, it’s better to choose VLC Media Player. The main difference between the two players is about iTunes movies. QuickTime Player can play iTunes M4V movies while VLC Media Player can’t play M4V movies directly. iTunes M4V movies have DRM protection and can’t be played on non-Apple devices including VLC Media Player. What if you would like to enjoy iTunes movies on VLC Media Player? Don’t worry, NoteBurner M4V Converter Plus can help you. As a powerful DRM removal tool, it can remove DRM legally from iTunes rentals and purchases. After removing iTunes DRM, you can convert the movies to different formats like MP4, MOV, AVI, etc. Now, let’s learn how to use NoteBurner M4V Converter Plus to enjoy iTunes movies on VLC Media Player. At first, you can download and install NoteBurner M4V Converter Plus on your Windows or Mac. 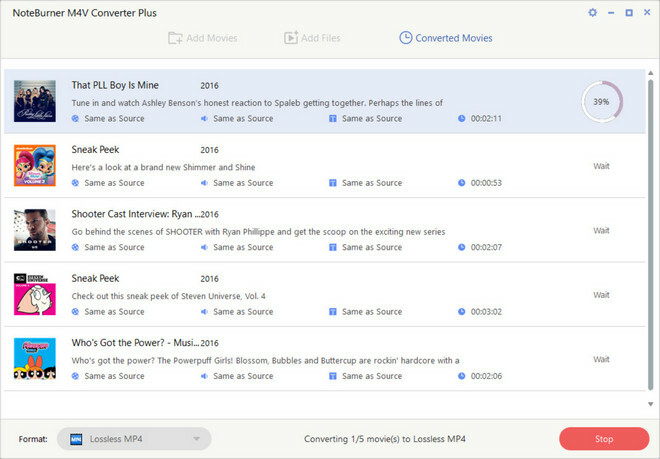 Launch NoteBurner M4V Converter Plus, click "Add Movies" button on the top-left or in the center, there will be a list of your iTunes purchased or rented movies. Choose the movies you need and then click "OK". Batch conversion is supported. Go to the dropdown list next to "Lossless MP4", you can choose "Lossless MP4" since it is accepted by VLC Media Player. You can also manually set the parameters like Codec, Bitrate, Size and Scale by clicking the Settings icon. Click "Convert" button on the bottom-right. During the conversion, please make sure you are not clicking on the button to control iTunes. 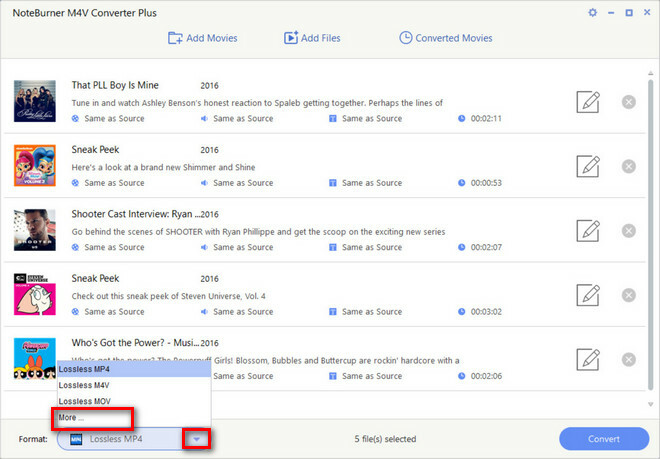 After conversion, you can find the converted iTunes movies in the output folder and add them to VLC Media Player. Then there's no restrictions and you can enjoy iTunes movies on VLC Media Player freely.